Highly concentrated acrylic resin, specially modified which, when added to cement and lime based mortars, enhances their properties. Increases the adhesion of mortars, as well as their flexibility, their watertightness and their abrasion resistance. 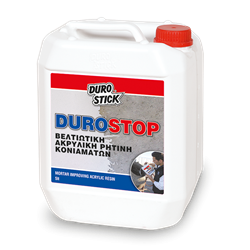 Protects plasters and bonding mortars from cracks created due to minor earthquakes and vibrations from excavating equipment operating in adjacent areas. Depending on the application, from 1:1 to 1:5 product to water ratio.